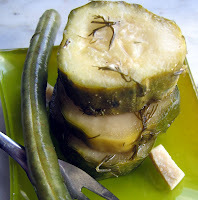 Crunch, sweet, spicy, bread and butter, cornichons - doesn't matter what type of pickle it is - I love them all! Imagine and egg salad sandwich without pickles, or a cubano or a pregnant woman...!!?? Wouldn't happen. This is my real first foray into pickle making. I asked around a little and came to the realization that anything goes. So I used what I had in the spice drawer. The one thing I'll say is that many of the spices I used were ground, rather than whole. Typically you would use whole - like mustard seeds rather than ground mustard. And you can always buy a pickling spice packet, but I made up my own, again, using some ground versions. But in this economy - I think this is a viable option if you are trying to save money and you have these 'ground' spices in your possession already. The liquid will look more muddy when you shake it, but I assure you, it's fine, really, trust me! I didn't go through the canning process either, so I just boiled the liquids and then kept the jars in the fridge. 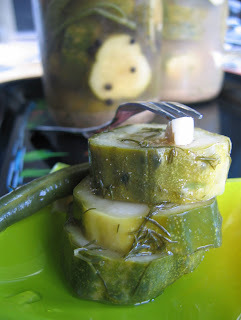 One last note- these pickles are pretty potent/spicy, which I really like. Just cut back on the garlic and cayenne (or red pepper, which ever you use) and yours will be more mild. I also added some green beans to my jars and they work great! Good for snacking, also a nice addition to an antipasto platter and also a great back to vodka shots (true Russian style - don't forget to sniff your sleeve!). That's bound to leave you fat and happy!! Add the water, vinegar and sugar in a pan, bring to a just boil to dissolve sugar and remove from heat. 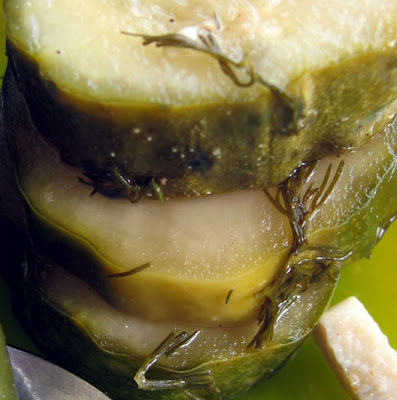 Add a, add the dill and place in your fridge for 2 weeks. Eat! You can add more 'pickles to the jars once they are empty; just allow them to soak for two more weeks.